WASHINGTON (CNS) — Pope Francis isn’t going to be visiting the United States until September, but that hasn’t kept the pope from going all around the nation, if only as a simple piece of paper for the time being. 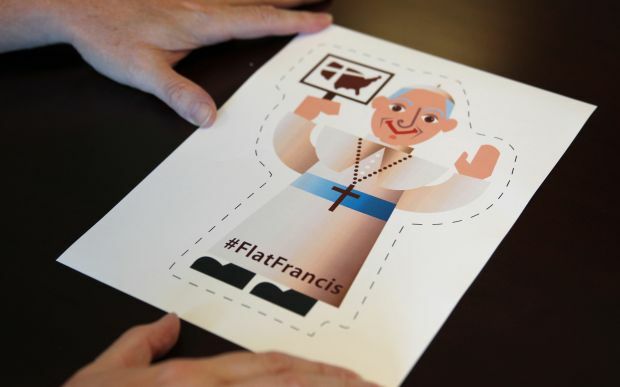 Chicago-based Catholic Extension is helping to build excitement and support for Pope Francis’ upcoming trip to the United States by creating Flat Francis. The project takes some inspiration from “The Flat Stanley Project,” which centers on a paper cutout of Flat Stanley, a cartoon drawing based on books of the same name, being photographed with people in numerous locations. This paper pope has steadily been making the rounds and creating smiles for many weeks now. All Catholic Extension asks is that people post their photos online using Twitter and Instagram, or even just email photos directly to the organization: socialmedia@catholicextension.org. Those who have taken to Flat Francis’ charm range from priests to families to Catholic schoolchildren. Even well-known comedian Jim Gaffigan and his family joined in on the fun in a photo posted to his wife Jeannie’s Twitter account.